Eschew the tourist crowds and head to Raptor Domain and Admirals Arch. Get some cultural insight at George's 40,000 Castle Lights and The Islander Estate Vineyards. Spend the 15th (Wed) exploring nature at Flinders Chase National Park. Spend the 17th (Fri) exploring nature at Kangaroo Island Wilderness Trail. It doesn't end there: identify plant and animal life at Hanson Bay Wildlife Sanctuary and enjoy the sand and surf at Stokes Beach. For other places to visit, maps, where to stay, and other tourist information, use the Kangaroo Island trip planner . Melbourne to Kangaroo Island is an approximately 3.5-hour flight. You can also do a combination of car and ferry; or do a combination of ferry, car, and bus. Finish up your sightseeing early on the 18th (Sat) so you can travel to Alice Springs. Get in touch with nature at The Kangaroo Sanctuary and Owen Springs Reserve. Do some cultural sightseeing at Alice Springs Telegraph Station Historical Reserve and The Residency. Spend the 23rd (Thu) exploring nature at Finke Gorge National Park. There's still lots to do: look for all kinds of wild species at Alice Springs Reptile Centre, get engrossed in the history at Alice Springs School of the Air Visitor Centre, take in the local highlights with Walking tours, and get great views at Anzac Hill. For reviews, traveler tips, and more tourist information, read Alice Springs trip maker app . Traveling by flight from Kangaroo Island to Alice Springs takes 5 hours. In April, daytime highs in Alice Springs are 34°C, while nighttime lows are 15°C. Cap off your sightseeing on the 23rd (Thu) early enough to travel to Cairns. You'll discover tucked-away gems like Trinity Beach and Daintree Rainforest - Cooper Creek Wilderness. 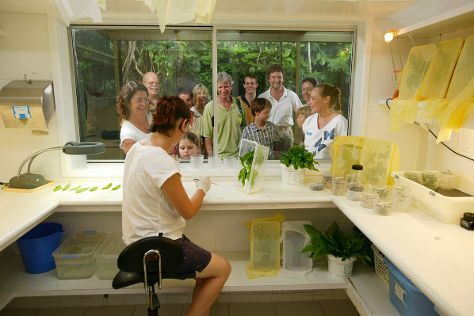 Escape the urban bustle at Australian Butterfly Sanctuary and Nature & Wildlife Tours. Change things up with these side-trips from Cairns: Cathedral Fig Tree (in Yungaburra), Mulgrave Settlers Museum (in Gordonvale) and Palm Cove Beach (in Palm Cove). The adventure continues: soar above the sights with a balloon tour, look for all kinds of wild species at Atherton Tablelands, and admire the natural beauty at Botanical Gardens. Fly from Alice Springs to Cairns in 4.5 hours. Alternatively, you can drive; or take a bus. Traveling from Alice Springs in April, you can expect nighttime temperatures to be somewhat warmer in Cairns, with lows of 26°C. Wrap up your sightseeing on the 28th (Tue) to allow time to drive to Port Douglas. Start off your visit on the 29th (Wed): relax and rejuvenate at some of the top local wellness centers, then learn about wildlife with up-close encounters at Wildlife Habitat Port Douglas, and then identify plant and animal life at Mossman Gorge. Here are some ideas for day two: admire the sheer force of Tranquility Falls and then identify plant and animal life at Agincourt Reef. To see photos, maps, reviews, and other tourist information, use the Port Douglas sightseeing planner. You can drive from Cairns to Port Douglas in 1.5 hours. Alternatively, you can take a bus; or take a shuttle. In April, daytime highs in Port Douglas are 34°C, while nighttime lows are 25°C. Finish up your sightseeing early on the 30th (Thu) so you can travel to Gold Coast. Escape the urban bustle at Coolangatta Beach and Cape Byron Walking Track. Eschew the tourist crowds and head to Burleigh Heads Beach and Natural Bridge. Step out of Gold Coast to go to Byron Bay and see Jules Hunt Studio Gallery, which is approximately 1h 25 min away. There's more to do: tour the pleasant surroundings at Currumbin Wildlife Sanctuary. To find traveler tips, maps, and more tourist information, use the Gold Coast trip planner . Getting from Port Douglas to Gold Coast by combination of shuttle and flight takes about 6 hours. Other options: do a combination of shuttle, flight, and train; or drive. Expect little chillier temperatures when traveling from Port Douglas in May; daily highs in Gold Coast reach 27°C and lows reach 15°C. Finish your sightseeing early on the 3rd (Sun) to allow enough time to drive to Noosa. 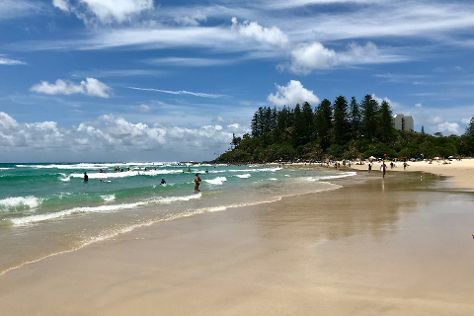 We've included these beaches for you: Mooloolaba Beach and Noosa Main Beach. Escape the urban bustle at Scuba & Snorkeling and Mary Cairncross Scenic Reserve. Get out of town with these interesting Noosa side-trips: Artworks in Clay by Anne Gentry-Smith (in Montville) and Rainbow Beach (Fishing Charters & Tours & Carlo Sand Blow). Spend the 4th (Mon) exploring nature at Noosa National Park. It doesn't end there: kick back and relax at Peregian Beach and contemplate the waterfront views at Noosa River. For other places to visit, more things to do, photos, and tourist information, read Noosa journey site . Drive from Gold Coast to Noosa in 3 hours. Alternatively, you can take a bus; or take a train. Finish up your sightseeing early on the 8th (Fri) so you can travel to Broome. Get outdoors at Nature & Wildlife Tours and Dolphin & Whale Watching. Do some cultural sightseeing at SSJG Heritage Centre and The Courthouse Collection. Next up on the itinerary: look for all kinds of wild species at Malcolm Douglas Crocodile Park and Animal Refuge, take in the dramatic natural features at Gantheaume Point, enjoy the sand and surf at Cable Beach, and take in the exciting artwork at Short St Gallery. For traveler tips, photos, maps, and more tourist information, use the Broome vacation planner. You can do a combination of train and flight from Noosa to Broome in 9 hours. Other options are to do a combination of bus and flight; or drive. Due to the time zone difference, you'll gain 2 hours traveling from Noosa to Broome. In May, plan for daily highs up to 38°C, and evening lows to 22°C. Wrap up your sightseeing on the 11th (Mon) to allow time to travel to Exmouth. Exmouth is a town on the tip of the North West Cape in Western Australia. Escape the urban bustle at Ningaloo Coast World Heritage Area and Ningaloo Reef. You'll discover tucked-away gems like Turquoise Bay and Wobiri Beach. 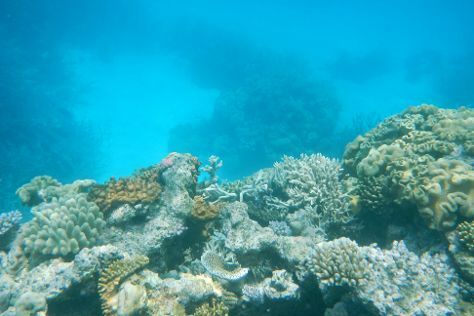 Step out of Exmouth to go to Coral Bay and see Ningaloo Marine Park, which is approximately 52 minutes away. There's lots more to do: step off the mainland to explore Muiron Islands, cast your line with a fishing tour, and have unforgettable encounters with a shark diving experience. To see reviews, photos, more things to do, and tourist information, refer to the Exmouth trip itinerary planner . You can do a combination of flight and car from Broome to Exmouth in 12 hours. Other options are to fly; or drive. Traveling from Broome in May, expect Exmouth to be little chillier, temps between 33°C and 18°C. Cap off your sightseeing on the 15th (Fri) early enough to travel to Margaret River. 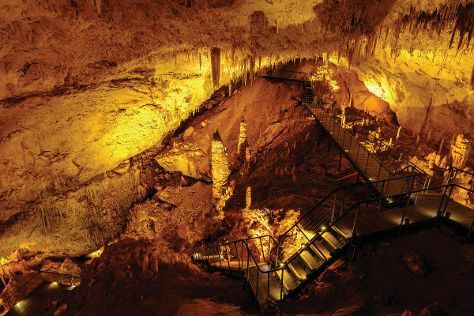 Get in touch with nature at Mammoth Cave and Ngilgi Cave. Your itinerary includes some good beach time at Meelup Beach and Hamelin Bay. Change things up with these side-trips from Margaret River: Canal Rocks (in Yallingup) and Augusta (Cape Leeuwin Lighthouse & Jewel Cave). Next up on the itinerary: Head underground at Lake Cave, savor the flavors at Food & Drink, enjoy the sand and surf at Surfers Point, and indulge your senses at some of the top wineries in the area. To see more things to do, reviews, ratings, and more tourist information, use the Margaret River trip itinerary builder app . You can do a combination of flight and bus from Exmouth to Margaret River in 10 hours. Alternatively, you can do a combination of car, flight, and bus; or drive. Finish your sightseeing early on the 20th (Wed) so you can drive to Albany. Take a break from the city and head to Greens Pool and Little Beach. Relax by the water at Middleton Beach and Cheynes Beach. 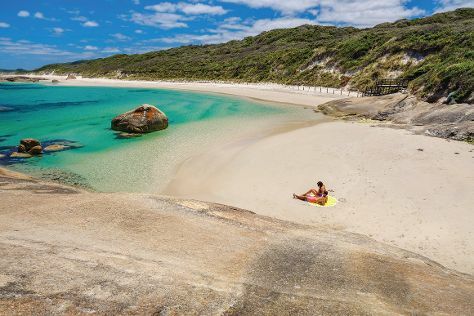 Explore Albany's surroundings by going to Forest Hill Vineyard (in Denmark), Cosy Corner Beach (in Kronkup) and Waychinicup National Park (in Cheynes). Next up on the itinerary: explore the striking landscape at The Gap and Natural Bridge, enjoy the sea views from Point King Lighthouse, identify plant and animal life at Kalgan River, and admire the landmark architecture of The Church of Saint John the Evangelist. To see other places to visit and tourist information, use the Albany trip itinerary builder tool . Drive from Margaret River to Albany in 4.5 hours. Alternatively, you can take a bus; or do a combination of bus and flight. In May, plan for daily highs up to 22°C, and evening lows to 10°C. Wrap up your sightseeing on the 25th (Mon) early enough to travel to Hobart. 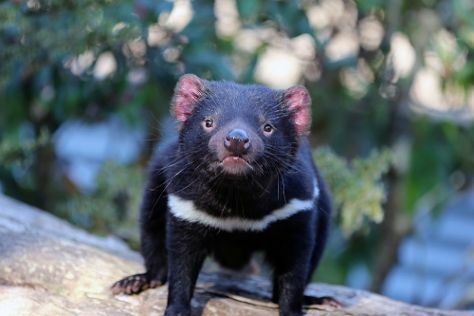 Visiting Tasmanian Devil Unzoo and Tall Trees Walk will get you outdoors. Explore hidden gems such as Battery Point Sculpture Trail and Mawson's Hut Replica Museum. 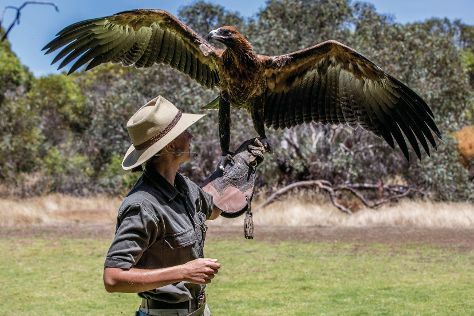 Venture out of the city with trips to Bonorong Wildlife Sanctuary (in Brighton), Eaglehawk Neck Historic Site (in Eaglehawk Neck) and Russell Falls (in Mount Field National Park). There's lots more to do: contemplate the long history of Cascades Female Factory Historic Site, get to know the fascinating history of Fern Tree, get curious at Tasmanian Museum and Art Gallery, and admire the natural beauty at Royal Tasmanian Botanical Gardens. To find more things to do, reviews, where to stay, and other tourist information, refer to the Hobart trip planning app . Fly from Albany to Hobart in 10.5 hours. Alternatively, you can do a combination of bus and flight. The time zone difference moving from Australian Western Standard Time to Australian Eastern Standard Time (Tasmania) is 2 hours. Prepare for a bit cooler weather when traveling from Albany in May: high temperatures in Hobart hover around 18°C and lows are around 7°C. Finish your sightseeing early on the 29th (Fri) so you can drive to Coles Bay. Discover out-of-the-way places like Freycinet National Park and Nature & Wildlife Tours. Step out of the city life by going to Dolphin & Whale Watching and Friendly Beaches. Explore Coles Bay's surroundings by going to East Coast Natureworld (in Bicheno), Madd=Mudd Studio Gallery (in St Marys) and St Columba Waterfall (in St Helens). Next up on the itinerary: stroll through Wineglass Bay Lookout, take a leisurely stroll along Coles Bay Jetty, and kick back and relax at Honeymoon Bay. For maps, ratings, traveler tips, and tourist information, read Coles Bay journey planner . You can drive from Hobart to Coles Bay in 2.5 hours. Another option is to do a combination of bus and taxi. Wrap up your sightseeing on the 3rd (Wed) to allow time to drive to Cradle Mountain-Lake St. Clair National Park. Escape the urban bustle at Devils @ Cradle and Hellyer Gorge. Step off the beaten path and head to Westmorland Falls and Barn Bluff. Step out of Cradle Mountain-Lake St. Clair National Park with an excursion to Philosopher Falls in Waratah--about 1h 20 min away. It doesn't end there: contemplate the waterfront views at Lake St. Clair. To see traveler tips, photos, reviews, and other tourist information, refer to the Cradle Mountain-Lake St. Clair National Park trip itinerary builder tool . Drive from Coles Bay to Cradle Mountain-Lake St. Clair National Park in 5 hours. Alternatively, you can do a combination of bus and car. Cap off your sightseeing on the 6th (Sat) early enough to travel to Port Campbell. Port Campbell is a coastal town in Victoria, Australia. Step out of the city life by going to Lorne Beach and Otway Fly Treetop Adventures. Explore hidden gems such as Great Ocean Walk and Mait's Rest. Change things up with a short trip to Childer's Cove in The Cove (about 32 minutes away). Spend the 8th (Mon) exploring nature at Port Campbell National Park. 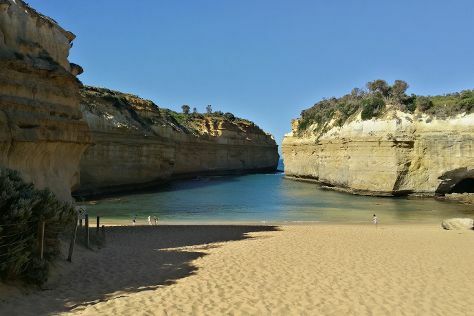 There's still lots to do: admire all the interesting features of Loch Ard Gorge, explore the striking landscape at Twelve Apostles, and don't miss a visit to Gibsons Steps. For ratings, where to stay, reviews, and tourist information, use the Port Campbell day trip planning site . You can do a combination of car, flight, train, and bus from Cradle Mountain-Lake St. Clair National Park to Port Campbell in 11.5 hours. Another option is to do a combination of car and ferry. Wrap up your sightseeing by early afternoon on the 12th (Fri) to allow enough time to drive back home.